This month, we thought we would share an update of San Diego Zoo Global's use of the Fundamentals, the Academy's 13-course animal care training series. This might be useful in the roll out of online training at your institution, as well. 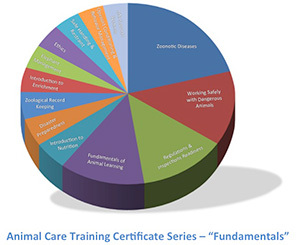 The 13 animal care training courses in the Fundamentals series have been taken successfully by San Diego Zoo Global staff over 3,000 times.The Zoonotic Disease course alone has been taken successfully well over 600 times, and the total is over 400 times for each of the other prerequisite courses. 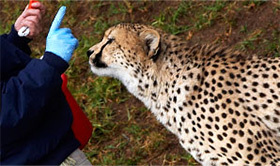 Another impressive slice of the pie is that over 400 San Diego Zoo Global employees have completed four or more of the animal care training series courses, and we are pleased to share that 87 of our employees have already completed the entire series. We have integrated online training into our operations. It is a requirement for new employees with animal handling responsibilities and now is a part of the progression through a career path, as well. More pie, please! 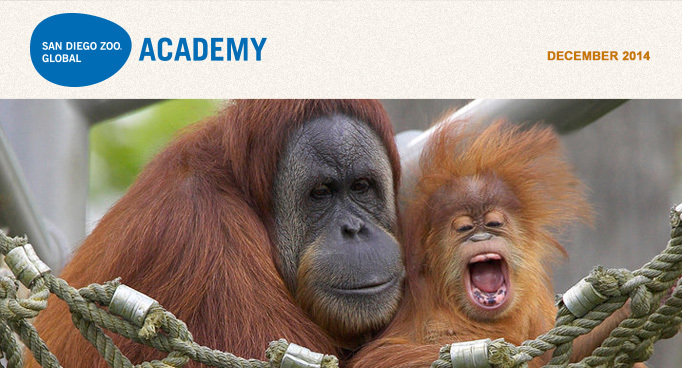 Keepers, interpreters, guides, and docents can dive into the fascinating world of these red apes as the San Diego Zoo Global Academy presents Orangutans, the newest module in Introducing Animals, our series about animal species and other taxonomic groups. The module explores the natural history and conservation of orangutans. Remarkable images show orangutans in ways you've never seen before, and video provides insights into their behavior. Interactivity sprinkled throughout the module engages participants in the learning process, and questions at the end of each section ensure that they have mastered fundamental concepts before they move on. The Orangutans module takes about 90 minutes to complete, although participants progress at their own pace and may repeat the entire course or sections of the course as many times as they like. These modules are an awesome resource for interpreters, but they offer insights to veteran animal keepers too, providing a glimpse of natural history that helps keepers address husbandry concerns. This module addresses common questions and provides an up-close exploration of what orangutans are all about. Whether you've worked with these animals for years or you're a brand-new interpreter or docent, the module will equip you with a better understanding of these amazing animals. The Orangutans module joins Great Apes, Lions, Cheetahs, Polar Bears, Giant Pandas, Tigers, and Gorillas in the Introducing Animals series. Look for modules about cats, elephants, birds, and mammals, coming soon. Click here to view a sample of the new Orangutans course. Join us for a webinar on Dec 17, 2014 at 11 a.m. PDT. This webinar is hosted by Academy partner CypherWorx and provides an opportunity for administrators to discuss resources, share ideas, and ask questions. Agenda items include new courses, course catalogs, and the DIY options. View Sample of Dr. Jones Second Webinar! In November, Dr. Jones—an aquatics animal veterinarian who specializes in the care of both freshwater and marine animals—presented his second interesting webinar for the Academy, titled "Nitrogen Cycle and Biofiltration." He reviewed one of the most common causes for the death of fish: ammonia toxicity, and to a lesser extent nitrite toxicity. Understanding the nitrogen cycle is essential for any type of fish keeping. Click here to view a sample of this presentation. 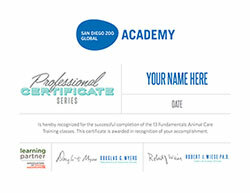 As the Academy continues to grow and expand its offerings, we want your hard work to be rewarded, and we want the look of San Diego Zoo Global Academy certificates to reflect your successful accomplishments and the innovation of the Academy. For that reason, we have redesigned the certificates with a new look. The new look now includes the AZA learning partner logo and your participating association or institution's logo to highlight your achievement. Also, San Diego Zoo Global Academy's Interpretive Series Certificates are coming soon! If you want to get a head start on this three-course series, the Interpretive Basics: Module I and II are already in the Academy catalog. The third online course, Storytelling, is scheduled to be finished in the first quarter of 2015. The Children's Zoo at Celebration Square in Saginaw, Michigan has joined the Academy's collaborative learning environment with their own privately branded custom site. Welcome! How do you ensure your volunteers have met your minimum requirements each year? Each December, we have volunteers complete an annual renewal form, a checklist of important reminders, update their emergency contact information, and any other pertinent information we need on file (sometimes including a quiz, or even a scavenger hunt of the Volunteer Connection web site!). Once completed, we check their hours and renew their ID card if they have met the minimum requirements for the year. You can post this information ahead of time on the Volunteer Connection site, asking them to print it, complete it, and bring it in with them, and post renewal dates on your Volunteer Connection calendar in the Events section. Make it a fun and festive occasion, with socials, special treats, fun give-aways, music, etc. Happy Holidays! 'Tis the season for reflecting on what has occurred over the past 12 months. End of year reports are nearing, and we are busy gathering data. I am checking our injury trends and checking them twice, in order to see what kind of training I should focus on in 2015 (and possible DIY courses). We are making a change to our safety committee here at San Diego Zoo Global: it will now consist of supervisory-level employees starting in January, and safety groups in My Academy will be updated to reflect those changes. As for planning, mandatory regulatory safety classes will be assigned to department representatives. I look forward to rolling out our new safety program for 2015 and the integration of the My Academy into the program. I wish you and yours a safe and joyous holiday season!